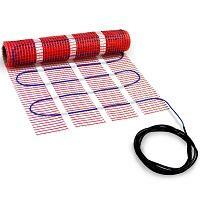 120V HeatTech mats are primarily designed for installation in areas with total space of 150 sqft or less (special controls available to expand the system to 1,500 sqft with a single thermostat). Typical rooms include kitchens, bathrooms, standing showers sunrooms and others with ceramic or natural stone tile floors. Pre-spaced on fiber mesh at fixed 3” apart, heating cable ensures even heat distribution, while adhesive backing of the mat allows to avoid repeat re-positioning and re-stapling of the mesh.